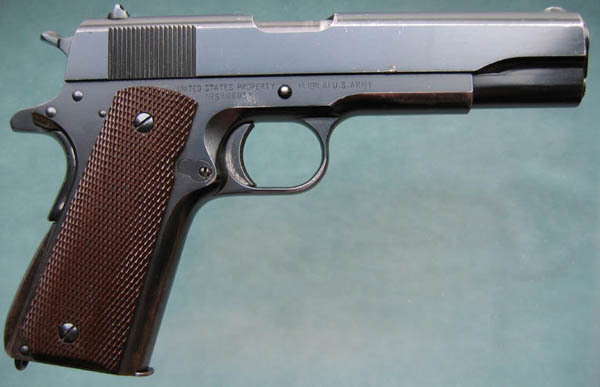 Colt Model 1911A1 S/N 800058 - In 1939, Singer Manufacturing Company based in Elizabeth, New Jersey was awarded Educational Order No. 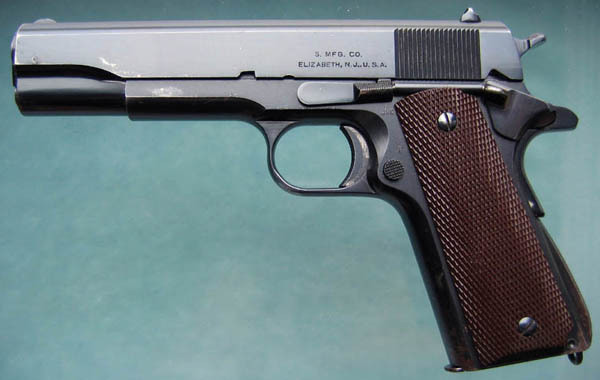 W-ORD-396 for the manufacture of 500 Automatic Pistols Caliber .45 M1911A1. Singer manufactured every part with the exception of the grips which were manufactured by the Keyes Fibre Company. There are no reinforcing rings around the grip screw holes and no reinforcement ribs inside the grips with 31 rows of checkering between the screw holes. Finish was a high gloss Du-Lite bluing. On May 21, 1940, Colonel John K. Clement, commander of the New York Ordnance District and Executive Officer and Army Inspector of Ordnance was designated to administer Singer's educational order. His initials, "JKC" were stamped on all 500 Singer pistols. Right side view - There is no ordnance wheel on the rear right side of the frame. 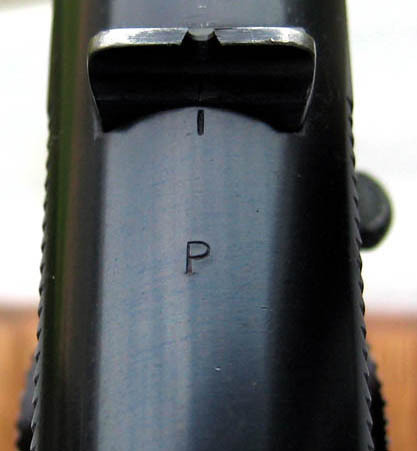 "P" proof on top of the slide forward of the rear sight. (Stamped in the opposite direction of the "P" proof on other 1911A1 contract variations.